As mobile tech gets ever more sophisticated, cheaper and cheaper phones get the features that were previously restricted to flagship designs. Samsung’s latest phones for the Indian market, the Galaxy M10 and M20, illustrate this principle perfectly. Let’s start with the M20. For just 11000 INR (about $155 USD), users get a huge 6.3-inch 1080p display with curved corners and a “teardrop” camera notch, as seen on the OnePlus 6T. That big body lets the phone hold an incredible 5000mAh battery, which should be good for multi-day charges. The phone features both a rear fingerprint reader and face unlock via the front camera, dual rear cameras with 13MP primary and 5MP ultra-wide secondary. A USB Type-C port, still not a given on budget designs, hangs out on the bottom with a 15-watt fast charger in the box. The M20 comes with 3GB of RAM and 32GB of storage on the base model, plus whatever you can fit in the MicroSD card slot. A more expansive model, with 4GB of RAM and 64GB of storage, will be 13000 INR (a bit over $180). Outside your budget? Then consider the Galaxy M10. It shrinks the screen just a tad to 6.2 inches, busted down to “HD+” (read: 720p) resolution, but with the same teardrop rounded corners and teardrop notch. Samsung doesn’t mention a USB Type-C port or fast charging on the M10, but it foregoes the fingerprint scanner (face unlock is still available) and massive battery, with a slower octa-core processor. 3GB of RAM and 32GB storage runs 9000 INR ($125), while the cheapest model with 2GB of RAM and 16GB of storage is just 8000 INR ($115). Even if the specs don’t wow you, it’s a fantastic deal for a phone that looks like a flagship from a couple of years ago. Tellingly, Samsung doesn’t mention Android in its press release, so there’s no telling whether the phones are running 8.0 Oreo or 9.0 Pie. 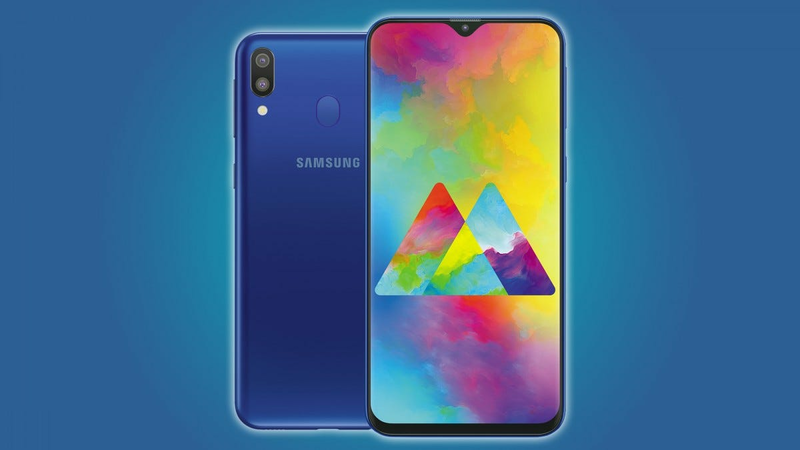 Samsung says the Galaxy M10 and M20 will launch in India first, on February 5th. They’ll be sold on the Indian Amazon storefront in blue and black variants. Given the company’s history and vast phone lineup, expect to see these models—or ones practically identical to them—available in other markets before too long. Amazon has grown its family of Echo products from a single smart speaker to a wide array of Alexa-enabled devices for every room in your home. If you’re feeling overwhelmed by the choices, or you want to pick the right gift for the holidays, we’re breaking down what your options are and who each Echo is for.